I love Bologna, in the heart of Emilia-Romagna. The rich cooking of that region has always been at the heart of my interest in Italian cooking, and Dillon and I spent a few wonderful days there ten years ago. During this most recent trip, although this sounds obnoxious, after 48 hours in Venice I was ready for a change of scenery. I was looking forward to eating meat and fresh pasta and mortadella! But I was exhausted. Between lack of sleep, eating too much, walking everywhere, getting lost, and more, I was ready for a night off. I arrived in Bologna at 6 pm and seriously thought of canceling my 8 pm reservation at da Fabio and staying in. Thank God I didn’t. I went for a pre-dinner walk to the center of town (about 10 minutes), and by the end of the walk, my exhaustion had disappeared and my appetite returned. Bologna was pulsing with life and my own energy was resurrected. By 8 pm, Venice seems dead, thankfully free of tourist traffic but also free of much life or energy. Quiet and reserve marks Venice after dark. Although I usually find myself drawn to quiet and reserve, I was ready for some life and I found it in Bologna. People were everywhere and energy pulsated all around me. This is partly because Bologna is a college town, with the oldest university in Europe (1088 AD), but it wasn’t just college students lighting things up. Here it was a Thursday night with work and classes the next day, but everyone was out. Old, young, babies in strollers. Stores were all open with music thumping from within. This was an Italy I was missing in Venice, and it felt pretty irresistible. By the time I arrived at da Fabio at eight o’clock, I felt revived. Although this restaurant hadn’t made anyone’s Top Five list, I was intrigued by the fact that they had no menu. Dishes were simply brought out, or if choices were allowed, they were delivered verbally. But nothing prepared me for what was about to take place. 8 pm is still early to dine in Italy, and the early reservation marked me as a tourist. I was the first one there. But my server was as gracious as could be with my imperfect Italian and his eyes burned with a kind of fire. He was talking a mile a minute and clearly amped up. He explained that he would just bring out every appetizer they were making tonight and I could try some of each, then I could order the rest of the courses as I chose. Yep, that’s all on my table. I was expecting four or five antipasti, and thus they came. Celery with parmigiano, onions in agrodolce, grilled bread, a frittata, chicken liver pate, grilled zucchini. Everything was great. But then to my astonishment, more arrived. 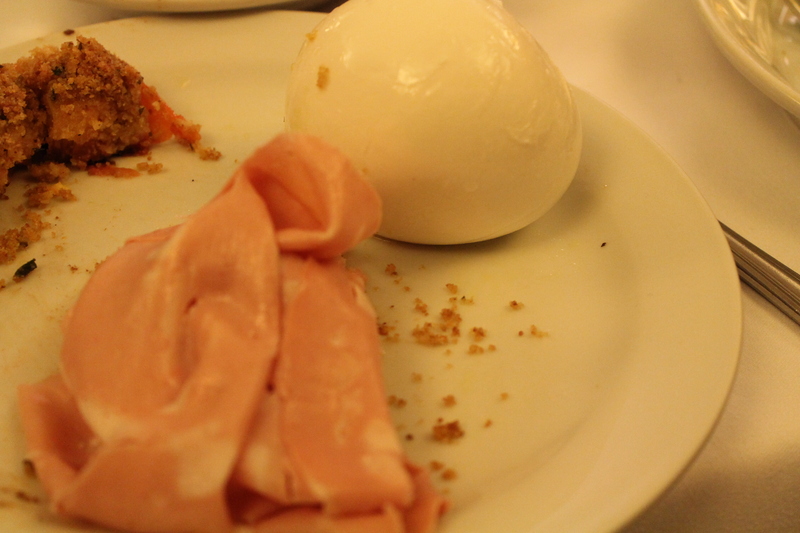 Three huge balls of mozzarella di bufala, a platter of exquisite mortadella, fried pork milanese. I ate what I could, but things were quickly getting out of hand. The Italians began to arrive. I was the only non-Italian in the place, and they were on fire too. Another server appeared, equally amped up, and soon the whole place had erupted in a cacophony of exuberance and joy. 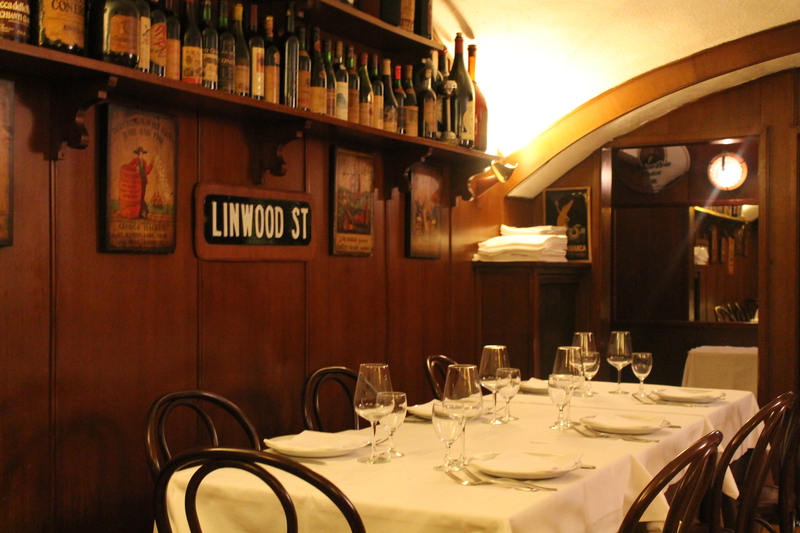 Here was no dining room of timid tourists or reserved Venetians. These people were overflowing with joy and life. 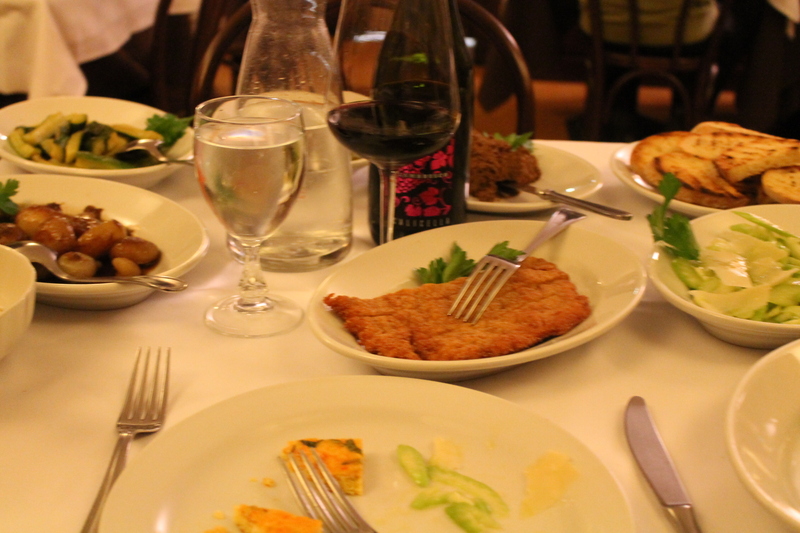 Gone was the exquisite but understated cuisine of Venice. This food and these people were overflowing with lusty passions and abundance. My neighbors at the next table (a local couple from down the street) starting talking to me, and went so far as to take a card and promise to visit our restaurant some day! They shared other restaurant recommendations for Bologna and were eager to know what I thought of the food I was being served. At another table, a couple was joined by a third man who showed up gesticulating like a maniac, walking his dog in on a leash which he promptly tied to his chair. Servers were moving fast, driven by some invisible source of boundless energy, nearly hitting each other coming in and out of the kitchen, my guy still with flames in his eyes. Fabio, the chef himself, alternated between yelling at his servers in the kitchen, wagging his finger at them, and smoking a cigarette right there in plain view of everyone. My neighbors got up to smoke outside. Perhaps as a reflection of my own exuberance, I thought of asking them if I could join them, but that seemed a little too personal and in the end, better judgment prevailed. I had asked for a glass of local Lambrusco, but the next thing I knew a whole bottle had been put down at my table. I did ask for a glass, right? Slowly it began to disappear, my fear of drinking too much outweighed by the irresistible impulse to give in to abandon like everyone else in the place. 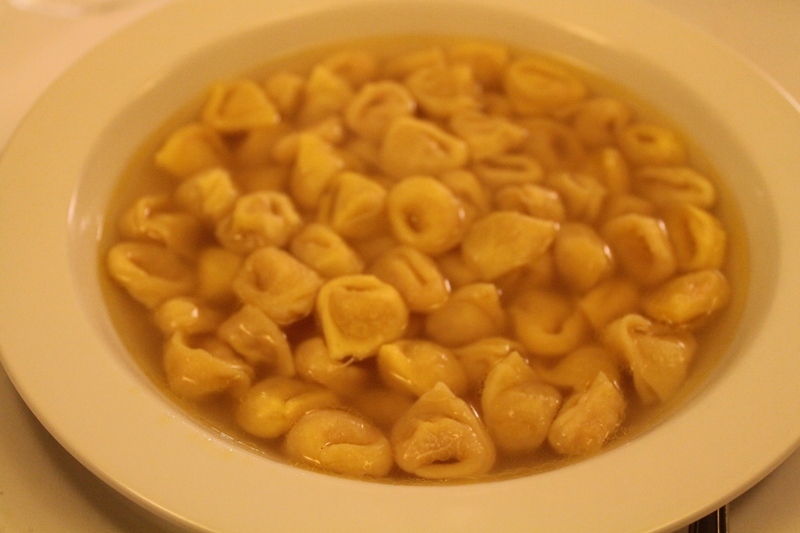 I ordered my next course: the classic tortellini in brodo, tiny packages of hand-shaped pasta in the traditional shape of Venus’s navel. 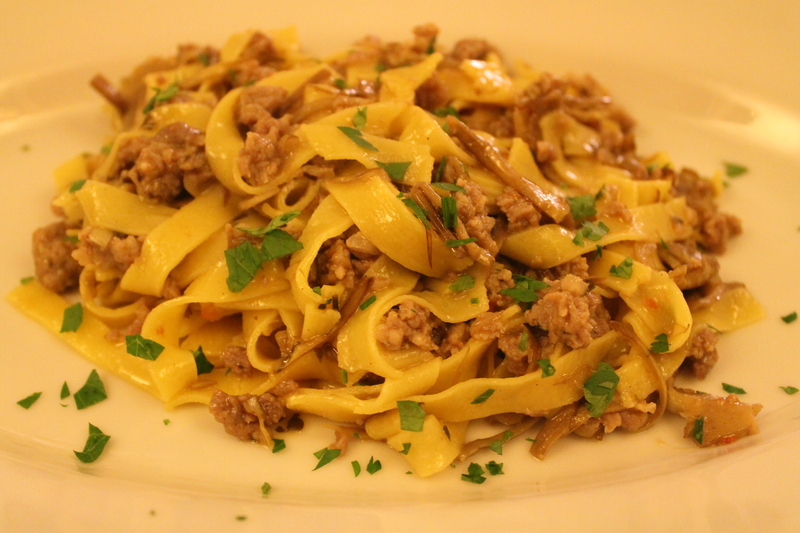 They were excellent, and so I ordered another dish of pasta which I found irresistible: tagliatelle with sausage and artichokes. Excellent again, even better than the tortellini. By this time, I was very full and rather tipsy. 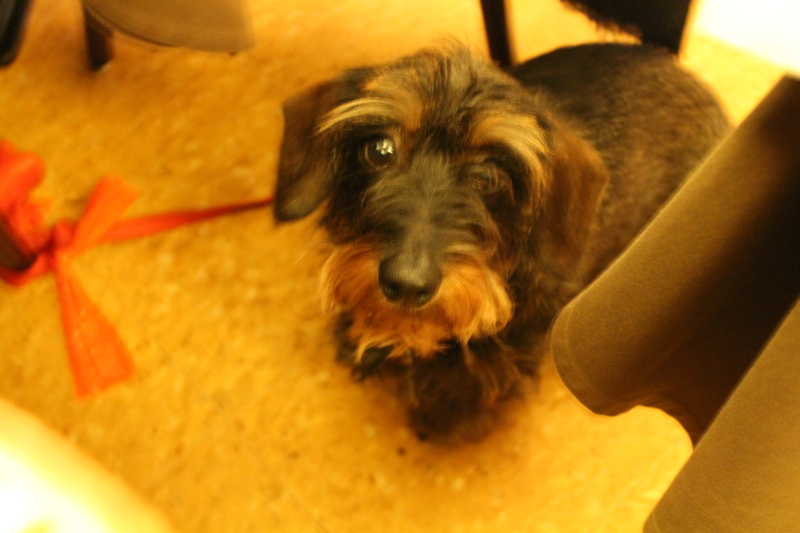 In the meantime, a server had brought in a bowl of water for the dog. My friendly neighbors had gotten cuddly. I knew I had reached the end of the line and simply couldn’t eat or drink any more (the bottle was empty). I told the server that I couldn’t eat anything more and just needed my check. But the next thing I knew, the piece de resistance of the evening, he brought out gelato. 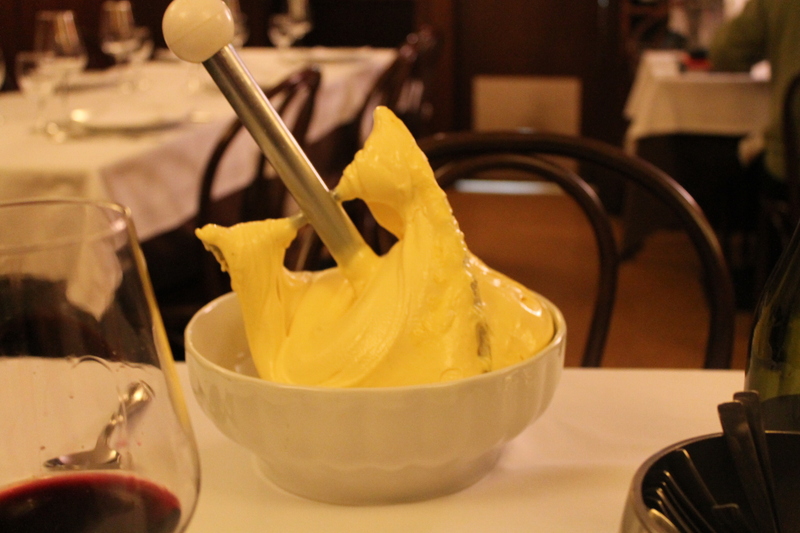 Not just a bowl, but a whole damn tub with the dasher still in, just thrown down on the table like it was nothing to be served a whole tub of custard gelato. I took my bowl. It was exquisite. He threw down the tub on my neighbor’s table and continued to talk to them for 10 minutes, like he had no other customers to help and while the gelato slowly melted. Hell, maybe they had ten more tubs back in the kitchen. I finally said my goodbyes and headed to the door. Somehow, though it was now past ten, it seemed like the spirit of the evening called for a walk back to town rather than an early bed time. Things had quieted down a bit, but there were still people everywhere. I realized at that moment, that a move to Bologna might be in my future, if only I can convince my wife and kids. wow. I was there for an afternoon and heard the most amazing organ played in a church. Sounds like it was a great night! Unforgettable place.